An RNLI coxswain whose sacking led to a mass demonstration on the streets of St Helier has been reinstated. 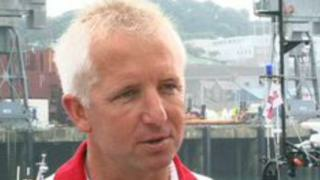 Andy Hibbs was told to stand down by the RNLI on 7 April, prompting his entire 25-strong Jersey crew to resign in protest. Mr Hibbs said he had been given a full apology by the charity and is looking forward to getting back to work with the rest of the crew. The RNLI said it would work to improve relationships with the crew. A spokesman for the charity said it did not meet the high standards of support and fairness they should have given to Mr Hibbs. He said the charity would work with Jersey emergency services "to restore a safe, effective and inclusive local volunteer lifeboat service.". They are appointing a full-time station manager to help support the crew. The dismissal of Mr Hibbs led to a protest on 10 April with hundreds of people calling for his return. There was also a call for people in Jersey to stop donating to the RNLI until he was reinstated. 7 April 2017: St Helier lifeboat crew walkout in protest at the sacking of Mr Hibbs. 9 April 2017: Hundreds of people protest in St Helier against the sacking. 10 April 2017: Relief crew made up of volunteers from across the UK used to cover the St Helier crew. 20 April 2017: Mr Hibbs lodges an appeal against his sacking. 28 June 2017: He is reinstated by the RNLI with a full apology. A temporary relief crew made up of volunteers from across the UK was brought in on 10 April but St Helier was left without a lifeboat for one weekend. The crew accused the RNLI of bullying Mr Hibbs, something the charity said would be fully investigated. He appealed against the decision which eventually led to his reinstatement and a full apology by the charity. Mr Hibbs said he hoped to be back in service soon: "It is a relief to get it over and done with and get back to what we did before. "The support from the crew was fantastic."